People in Mexico, as well as in numerous parts of the United States, have a celebration on May fifth. This festivity is called “Cinco de Mayo.” People dance and sing Mexican songs, the Mariachis play, children break piñatas, and so on. During the Cinco de Mayo holiday, Mexicans celebrate their victory over the French in the Battle of Puebla, which took place on May 5th, 1862. Beto and Gaby learn that their family can’t come to the Thanksgiving feast because it is snowing. Their mother plans to distribute the food to neighbors. Meanwhile, their grandmother is on her way and invites everyone she meets to celebrate Thanksgiving with her and the family. This book also tells the history of Thanksgiving, beginning with harvest celebrations, continuing with the first Thanksgiving near El Paso, Texas in 1598 and the Pilgrims in Massachusetts. Modern Thanksgiving traditions include parades, feasts, and sharing with others. Bolívar’s horse, Palomo Blanco, and his dog, Nevado. They describe details of Bolívar’s love for his animals and his skill in leading his troops in a very difficult campaign. The book includes a glossary and biographical information about Bolívar. Frog and Toad, the likable duo, fly kites, clean the house, and tell ghost stories together. And they even learn about the value of being alone. Frog is more perceptive than Toad; his supportive manner with his friend shows that personal differences don't have to get in the way of friendship. The formidable adventures of Mr. Fox and his family as they try to outrun three farmers determined to catch them..
Amber Dorado is ready for a perfect day at the county fair. Amber, her parents, her best friend Justin, and his family are in the Poconos on vacation. She's got it all planned, hot dogs, cotton candy, games, and wonderful rides. The morning does turn out exactly as she hopes it will, but then her mom and dad get into a fight, a perfect day at the fair turns into just a day at the fair. Good moods, bad moods, Judy has a mood for every occasion! Right now she's in a jealous mood of Jessica Finch, whose picture is on the front page of the newspaper. When Judy sets off in pursuit of her own fame and fortune, watch out! She's so determined, she just might find it, but all her efforts end up making her more infamous than ever! The clever and lazy fox suggests to Julieta, the armadillo, that they work together on his land, which is full of weeds. The fox wants to trick Julieta and take advantage of her, but Julieta uses her intelligence and imagination to outsmart the fox. This adaptation of a folk tale teaches important concepts about farming and crops, and emphasizes the value of work. 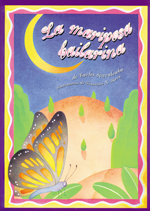 In this imaginative tale, based on the migration of the monarch butterfly, the Moon becomes spellbound by Lucero's beautiful dance. The Moon claims Lucero, the ballarina butterfly, and turns her into the bright star that guides the thousands of butterflies in their migratory journey from Mexico to Canada. In La primera caminata lunar, while visiting Smithsonian Institution's National Air and Space Museum, a boy daydreams that he is Neil Armstrong on his famous 1969 Moon mission. Just like Armstrong did, the boy lands on the Moon and takes one giant leap for mankind. Little Bear spends the day being amused by his grandparents stories. They tell him stories about a little robin's life and an elf's encounter with a curious noise. At the end of the day, Little Bear and Grandpa Bear convince each other that they don't feel tired. 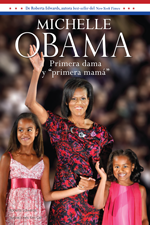 Michelle Obama: Primera dama y "primera mamá"
Michelle Obama never considered a life in politics, but now she is our First Lady. From the bestselling duo of "Barack Obama: United States President" comes this easy-to-read biography filled with photos of the entire Obama family. It charts Michelle’s life from her childhood in Chicago, her years at Princeton and Harvard Law School, and her historic journey to the White House. Paco is an immigrant. He is also a wonderful 11-year-old Latin-American boy full of dreams and humor. In this story, Paco tells us about his life, his culture, and about his fears and hopes after leaving his homeland. We also learn how he acquired a new language and a new culture. Paco feels blessed because now he has the opportunity to be whatever he wants to be. How important is the role of your family in your life, to help you overcome your fears and to achieve what you want?